Lacking a press pass and sticking out like a sore thumb without a tie-dyed shirt, I was still able to enjoy a night of classic jam band music at the Gov’t Mule show at the Bank of America Pavilion. Allman Brothers alum Warren Haynes displayed immense talent on lead vocals and guitar, adding the perfect classic rock twang to the traditional jam band sound. It was definitely one of those shows you have to experience in person for the full effect, and it was a great end to a summer of amazing music. cool! 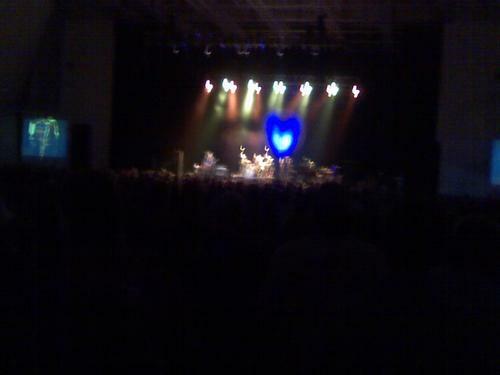 the blue light/blur looks like a heart! I've never heard of gov't mule, I'll have to check them out. Nice Job on this blog said to see its the last one!! Sad to see this is the end of this blog!! you did a great job and had awesome picks!! Melissa, you've done a great job on this blog. I feel like I've been going to concerts all summer. Thanks and Good luck! You hit the nail on the head with the lack of tie dye! I could only imagine you at a GOVT MULE show. Glad to hear you enjoyed it. Melissa, I've enjoyed your blog. You've done a great job. I found all of your posts informative and interesting. And a remarklable job with the pictures. I think you've found your destiny. Good luck with the contest! orry i couldnt comment yesterday, our computers randomly wouldnt let us on the internet all night. i dont know if its too late but i wanna give you some support. Sad to see this is the end of this blog! There is no question that most of people enjoy in watching NBA sports .As The NBA holds the most highly skilled players in the game of basketball and because it is known worldwide even basketball kits adds to the awesome revenues that the NBA gets. That is why nba jerseys become so popular among all the people. The way to show off your loyalty to your favorite teams and players is to wear nba jerseys as well as watching NBA games. There are many NBA jerseys stores ,the best way for you to choose is to get on the line where you will see countless NBA jerseys stores ,then you can choose one or two you love most .Before you have a deal ,be sure that this store is reputable which will guarantee the quality and offer you best services .Welcome to visit our website at http://www.nfljerseymvp.com ,where you will see a lot of NBA jerseys ,also include other jerseys ,such as nfl jerseys, MLB jerseys, NHL jerseys .You will never be regret to choose our store online and we will be here for offering you all best NBA jerseys, NFL jerseys, NHL jerseys, mlb jerseys you all the time.